Is there a distracting traffic sign in the middle of your video, or maybe something in the background that needs to be removed? I spotted a software application that can do that--and more--and I promise, you'll be amazed. The video I watched was produced by a group of researchers from the University of Washington's Department of Computer Science and Engineering. These guys are in the Graphics and Imaging Laboratory and they have a truly astounding process that lets you combine low resolution still images into high resolution video. The software merges the images and video, and at the same time, fixes the inconsistencies between the two. 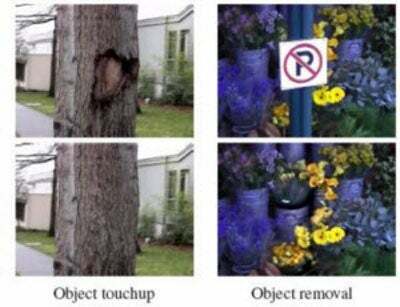 For instance, they show how, within the video, to remove a traffic sign or touch up a tree. Watch these two videos to see how it works. The first is "Using Photographs to Enhance Videos of a Static Scene." The second is "Interactive Video Cutout." You can also read the group's technical white paper, "Using Photographs to Enhance Videos of a Static Scene." Pravin Bhat, one of the authors of the software project, gave me the bad news. "We are currently busy working on other research projects and don't have the time to put in the engineering effort required to turn our research project into a product [or] usable demo. "Ideally a product team in the industry would carry the torch from here on. The implementation details of the project have been published in an academic journal, which people can access freely from the project Web site. "We have also released our source code on the project website. The Blender 3D folks are looking at incorporating it into their next open source release. "All our work is part of academic research. It is not patented. It's really anyone's for the taking but it will require considerable skill to turn it into an usable product from its current state; the research demo is slow, memory inefficient and not user friendly (there's no UI; everything is controlled with command-line tools)." Okay, so it's not an easy-to-use program--it's not even available. But my guess is that some smart entrepreneur could do something with it. Okay, how about some real-life photography? Good Tutorials brings together some of the smartest, single-issue tutorials I've found. Some are nice and short, but with plenty of meat to chew on. Dave Johnson's Digital Focus: Every week, PC World's photography expert cranks out a newsletter full of handy and clever tips. For instance, if you liked Good Tutorials, try Dave's "Treasure Trove of Photo Tutorials." Digital Tool Shed has a stack of resources for digital photography, including image editors, photo viewers, slide shows, audio and video tools, and other links. PhotoSig is a great spot to post your images for critique--and a super site to learn from other photographers. The message board forums on DPReview are organized by topic and camera brands. If you're buying a digital camera, you'll find the reviews, critiques, and no-nonsense advice refreshing. Want to edit your photos for free, on the Web? Check out "Web Photo Fixers" for a look at a slew of sites, including Adobe's free Photoshop Express online and a lot more. Oh, you say you don't want to be tied to the Web? Fair enough. Try one of these downloads. Stressed out at work and longing for a simpler life? Try being a sheepherder for a while and you'll be longing for the office. Here's another simple little Flash game from the maker of Board Dots. It's just as easy--all you do is flip over all the squares by moving your mouse over them. No problem, right? You want another Flash game, I know you do... How about building your own boat and launching an armada? Quick, what's the Martian Rover up to today? Find out at the official NASA Web site.